Homelessness is a major issue in Canada, affecting 200,000 people every year and costing $7 billion to the economy. The prevalence of mental illness within the homeless population is higher than in the general population: 50% of homeless individuals have some form of mental illness, compared to 20% of Canadians. Homelessness and mental illness often occur concurrently, significantly affecting individuals and communities. If we include people who are vulnerably housed, as many as 520,000 Canadians lack safe, affordable and supportive housing. 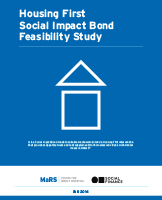 This feasibility study suggests that a Social Impact Bond (SIB) could be used to fund a Housing First (HF) intervention that aims to improve the lives of homeless individuals with mental illness. Funding broader implementation of Housing First using a SIB would share the implementation risk associated with replication, scaling and modification from governments with investors, and would establish a rigorous performance measurement framework focused on outcomes. A SIB could also be structured to target outcomes that are associated with cost savings.